Are you a vintage lover looking to put your stamp on a period home? Discover how Ben and Mark Hamilton Anderson made the most of their small and find plenty of ideas on how to incorporate upcycled furniture, kitsch collectables and floral fabrics. Love this? See all our real home transformations. Even before setting foot inside, Mark and Ben Hamilton Anderson knew they would buy Dynamite Cottage. Standing in half an acre of overgrown gardens, the listed building was in a poor state of repair but offered exactly the kind of country lifestyle the couple hoped for. ‘We had been living in an apartment in Southampton with no garden,’ explains Mark. ‘A village home with a large garden where we could keep chickens was our dream, even though moving to Dorset meant finding new jobs and a complete lifestyle change. It was all a bit of a whirlwind.’ Dynamite Cottage is in one of Dorset’s most attractive villages, featured heavily in Thomas Hardy’s novels. The house was given its unusual name some years before when a child discovered a stick labelled TNT in one of the outbuildings. Nearby homes were evacuated and the police were sent in, only to discover that the ‘dynamite’ was in fact a theatre prop left behind by previous owners who were into amateur dramatics. Originally built as a laundry cottage it was one of 12 similar properties, four of which were demolished around 15 years ago after they fell into complete disrepair. Ben and Mark were determined to bring their brick and flint cottage and garden back to life with some quirky personal touches. ‘We moved in during November 2014 and immediately began drying out the damp, cold rooms,’ Ben recalls. ‘With a tight budget we knew that we’d need to do everything ourselves, and had a few mishaps along the way, such as screwing into a water pipe in the wall one Sunday when replacing a skirting board. ’The semi-detached cottage had previously been used as a holiday let and has three bedrooms, with a bathroom and living/dining room on the ground floor and a tiny kitchen area under the stairs. Keen to preserve the cottage’s existing features, Ben and Mark set about repairing and painting windows. They carefully stripped and sealed the impressive original flagstone floor downstairs and painted the bedroom floorboards black for dramatic impact. ‘The flagstones are porous so we read up on the best way to preserve them, and it’s such a practical and beautiful floor,’ Ben explains. 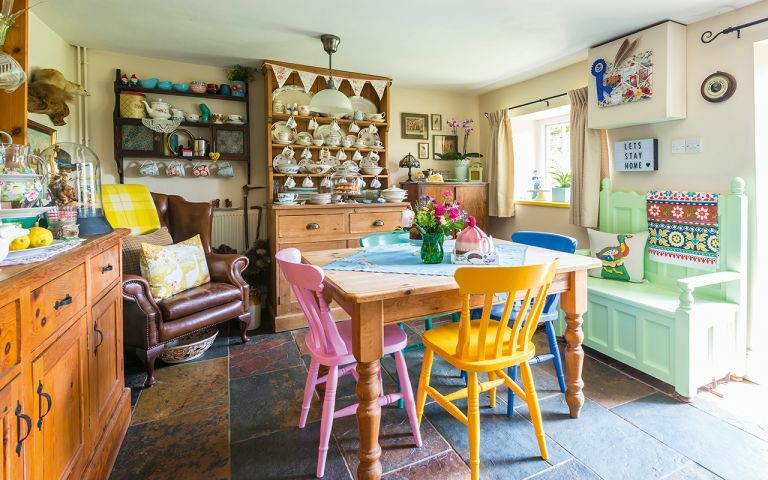 Walls were painted cream and white to create a blank canvas for the couple’s colourful furniture, some of which came with the cottage; other bits salvaged from skips, or found in charity shops. ‘Mark has a great eye for styling rooms and we both love kitsch and colourful vintage pieces,’ says Ben. ‘Moving to a country cottage and embracing the lifestyle has been fantastic, and we have wonderful neighbours and enjoy living in a friendly village,’ says Mark.